Phrenicea Spring Art Contest winner! 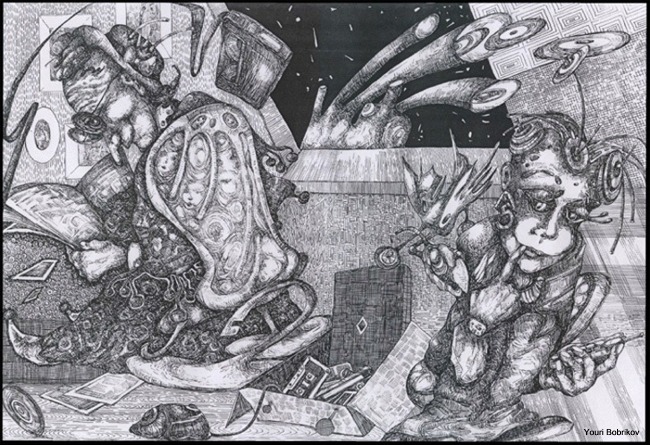 The Ukraine's Youri Bobrikov inked an incredibly detailed illustration inspired by the short story, "The Engagement of Phrenicea." To paraphrase Youri, "I showed two different worlds which exist under one roof — dissolved in the world-model Phrenicea. The magic of an old box just opened stops time. For Grandma Nancy it is the fresh air of reminiscences; for her granddaughter Ticara it is strange and unexpected things. The moment is miraculous but short." Youri's contest-winning artwork is featured on the cover page of "The Engagement of Phrenicea" short story.